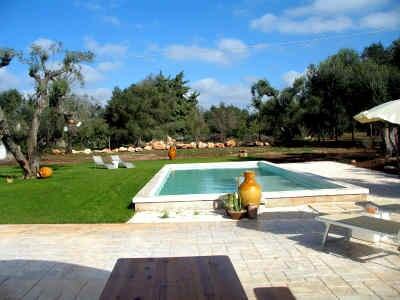 Just a few kilometers from Cisternino and Ostuniaway lies this puglia holiday house with pool (2016) on a large olive grove. The house wascomfortable furnished and equipped by the owner with many small details from his travels.A cozy holiday home for your vacation Apulia. The ground floor has a large kitchen, which merges into the living area where there are twobeds, but also likes to be used as a sofa. Furthermore, there is a reading area and thespacious and bright bathroom. On the upper floor (gallery) lies the double bed room with access to the large terrace. The house disposes of a heating, so it is habitable also in the colder months. In front and behind the house, you have plenty of space to enjoy a lot of time outdoors,whether while relaxing, reading or eating. The near surroundings allowing you to explore from here, only a few kilometers away are numerous attractions such as the baroque town of Martina Franca, “the white city” of Ostuni, Alberobello, the famous and southern town of Lecce – “the Florence of the South”.Furthermore, also reached nature reserves and the miles of the beautiful coastline quickly. Price including water, cooking gas, bed linen, towels, final cleaning. To be paid on site:Heating according to consumption (approx. € 10.00 / day), security deposit € 100.00.